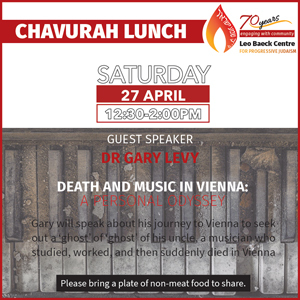 Join the community for a chavurah lunch, with our guest speaker Dr Gary Levy presenting Death and Music in Vienna: A Personal Odyssey. In 2017, Gary visited Vienna for the first time, to seek out the ‘ghost’ of his uncle, a musician who studied, worked, and then suddenly died there shortly after Gary was born. This journey culminated in a presentation Gary gave at a conference on Music & Death, in Vienna.